Green grass, white clothes, and prodigious amounts of tradition. It must be Wimbledon time. Enter into a discussion of WASP’y sporting pursuits and it won’t be long before you’re talking tennis. The reason? Simple. As far as WASP’y sports go, tennis really has it all: an English heritage, plenty of history, loads of tradition, a distinct association with country club culture, and of course a complicated set of rules that make absolutely no sense to the casual observer. And when it comes to tennis at its WASP’iest, nothing even comes close to Wimbledon (That’s actually The Championships, Wimbledon if you want to be really proper about it). Wimbledon is to tennis as St. Andrews is to golf; the spiritual home of the sport. It’s not only the oldest of the four Grand Slam tournaments, but having been played since 1877, it’s the world’s oldest (and most prestigious) tennis tournament, period. Between its long history and English setting (taking place at the All England Club in suburban London) you might expect tradition to play a central role at Wimbledon, and naturally, you would be right! In fact tradition is really what sets Wimbledon apart. 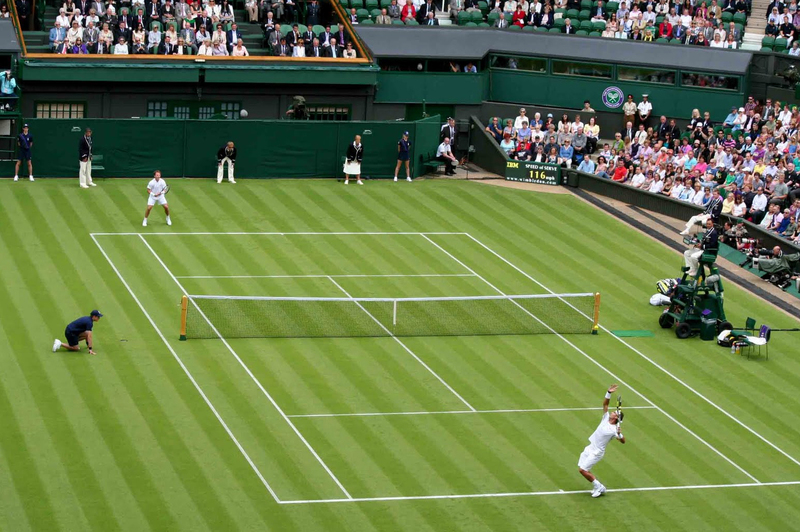 While the other majors have embraced the usual aspects of modern professional sports (technology, advanced playing surfaces, styling, advertising, etc…) Wimbledon has insisted, to the maximum extent possible, on keeping things as they have always been. Wimbledon is famous for its playing surface and strict dress code. The most unique aspect of Wimbledon is the playing surface: grass. A century ago this wasn’t anything special as most tennis was played on grass (the game was originally called “lawn tennis” after all). However, most tennis today is played on a hard court, or occasionally on clay. In fact these days it’s pretty rare to come across a grass tennis court at all since they require so much work to maintain. 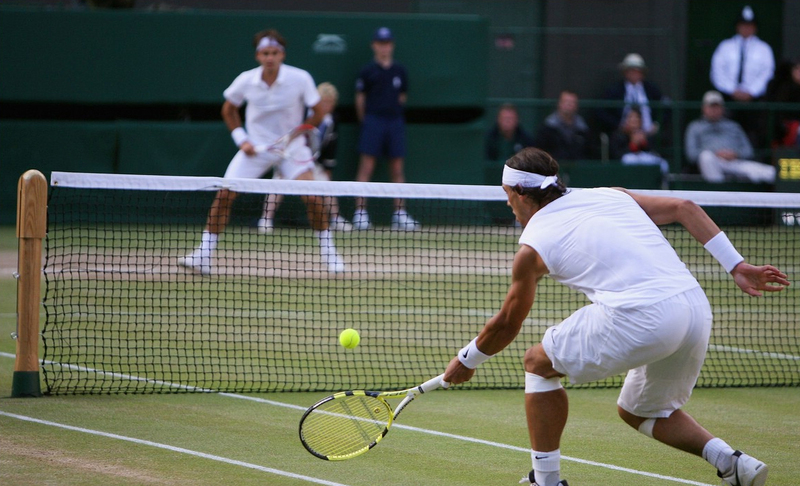 While the grass court is undeniably cool looking, it also has a major impact on the game itself. Grass is the fastest surface on which tennis is played, which is mainly due to the low friction between the grass and the ball on impact. This means that balls move faster and bounce lower than the players are used to. Also the relatively irregular surface creates more variation and odd bounces, which are also difficult to address. Those conditions tend to favor “all court” style players who can move quickly and hit a wide variety of shots from anywhere on the court, which in turn generally makes for exciting tennis. Another uniquely Wimbledon feature is the dress code: all white. Tennis players can wear whatever crazy colors they like during the rest of the year, but when they play at the All England Club, the choice is made for them. While this may seem boring, the on-court effect is actually very cool, especially when set against the grass court backdrop. It isn’t unusual for the Royals to make an appearance. Beyond the court and the dress code, Wimbledon is packed with all sort of other minor nods to tradition. You’ll see very little advertising on the court for example. 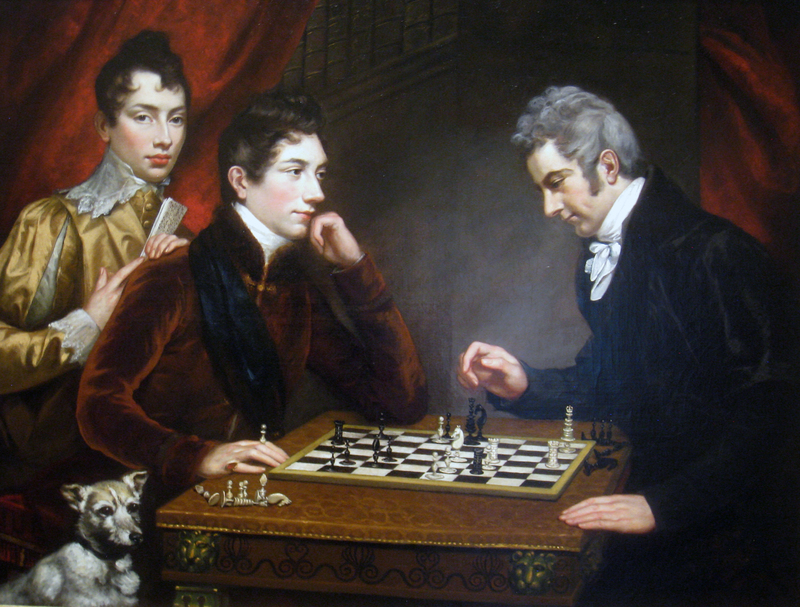 You’ll also usually see members of the Royal Family in attendance, especially in the later rounds of play. The overall effect is a retro look back at the way tennis used to be enjoyed, but with modern competition among some of the best athletes ever to play the game (more on that to come). Tennis is a fairly complicated game, but thankfully the basics required to enjoy a match on TV (or if you’re lucky enough to go in person) are easy to get down. First we’ll look at scoring. A tennis match is decided by “best of” series of “sets”. Sets are decided by “games” and games are decided by “points”. In a major, women’s matches are decided on a best of three sets series and men’s matches are a best of five affair. 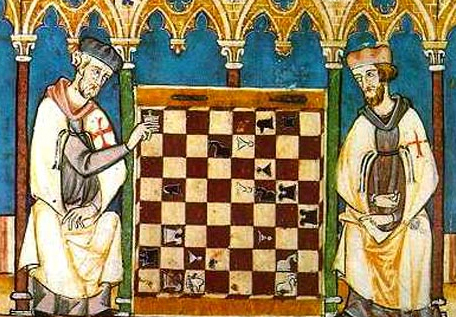 The sets themselves are generally decided by the first player to win 6 games. However, there is a catch: you must win by 2 games. This means that a set can’t end on a score of 6 to 5. If that happens, another game is played. If the player who had 6 wins, then he wins the set 7-5 (having won by two). If the player who had 5 wins, then the score is tied 6-6 and one of two things can happen. 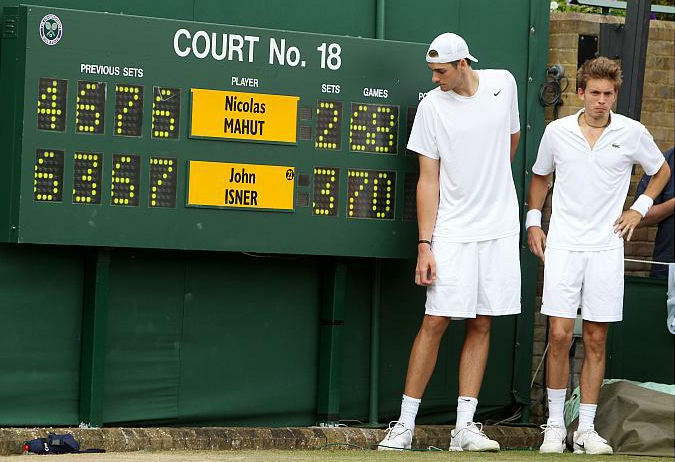 Final score of the Isner vs. Mahut match in 2010, which took 11 hours 5 minutes to complete. If it’s the final set of most Majors (Wimbledon included), then play will continue until one player has won by two games. Sometimes this can go on for a very long time. In fact the longest match ever played was at the 2010 Wimbledon Championship where John Isner won the final set 70-68! 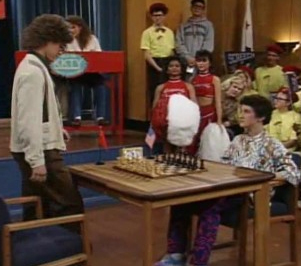 However, most often the set will go to a tie breaker, where the first player to reach 7 points wins. But like sets, a player has to win by at least two points. This means that tie breakers can go on for a very long time as well, but since a winner is decided by 2 points (as opposed to 2 games) they’re generally much quicker. The final score of a set decided by tiebreaker is recorded as 7-6. So, for example, a game where a player has won 3 points, while his opponent hasn’t won any, would have a score of 40-Love. If his opponent wins the next point, it’s 40-15. And if he wins the next, that’s game. Pretty easy, but keep in mind there’s that pesky “win by 2” rule to deal with. In the case of a game, if the score reaches 40-40, it’s referred to as “deuce”. The player who wins the next point then has the “advantage”. 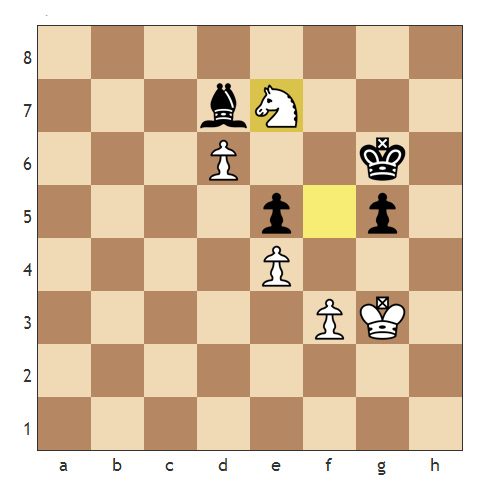 If he wins the point after that, he wins the game (having won by 2). If his opponent wins the next point, the score goes back to deuce (sometimes you’ll see the number of times deuce is reached appended, so in this case it’s deuce #2). Play continues in that manner until one player wins the deuce and his advantage point. Once you understand the scoring, the play is actually pretty simple. The players line up at opposite ends of the court. One is the server and the other the receiver. Once the server is ready, he’ll stand just behind the baseline (see diagram), toss the ball up, and hit it into play. That first hit must travel over the net and land somewhere in the opposite court’s service box. From that point on anything goes so long as the ball travels over the net, lands in bounds, and doesn’t bounce more than once before being hit. 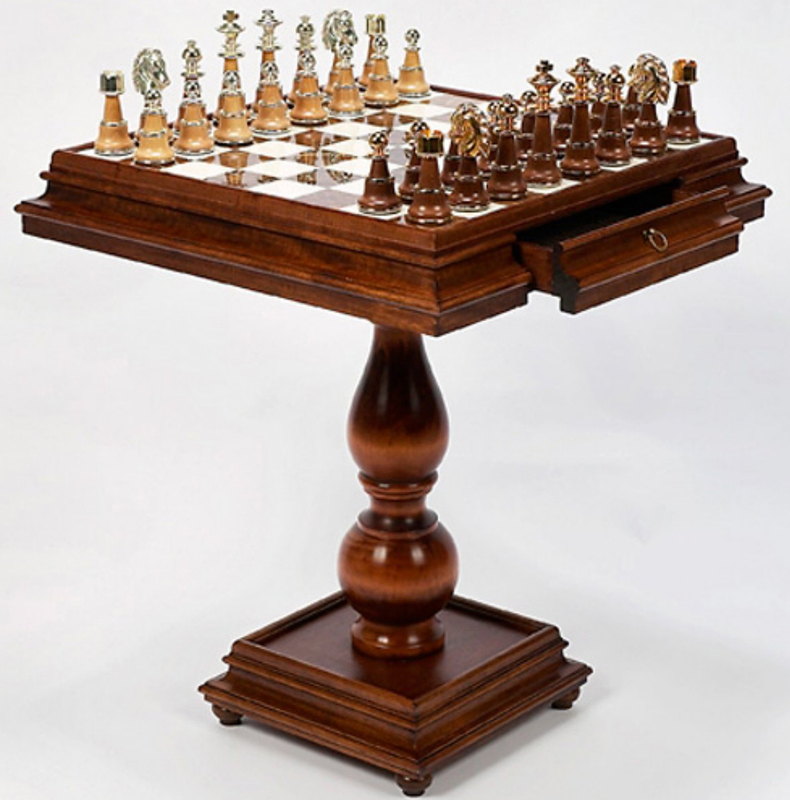 The first player to violate those rules loses the point, at which point the ball goes back to the server and the process repeats. 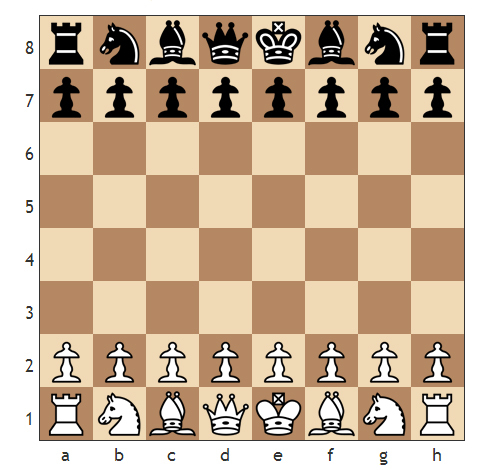 A player serves for the entire duration of the game, but will switch sides (left and right) after each point. 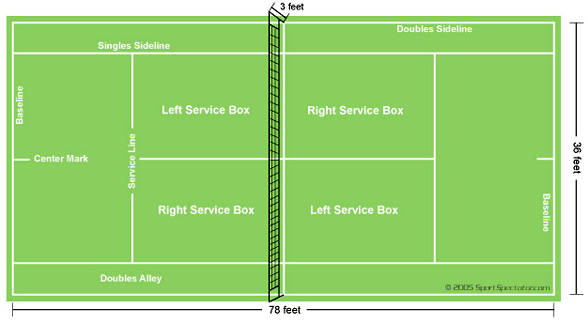 Basic anatomy of a tennis court. Once a game has concluded, the receiver becomes the server and vice-versa. It’s generally considered an advantage to serve, which is why service alternates after each game. After every odd numbered game (so at the end of games 1, 3, 5, 7, etc…) the players will switch ends of the court and get a little break. Play continues in that manner until one player has won 6 (or 7) games to win the set, and ultimately 2 out of 3 (or 3 out of 5) sets to win the match. Deuce Side: The right side of the tennis court. The first service in a game will always begin from this side. Ad Side: The left side of the court. Break: This is when the receiver (as opposed to the server) wins a game. The final point is called a “break point”. Breaking an opponent is usually considered a major advantage and will often decide a set. Hold: The opposite of a break, this is when the server wins the game. 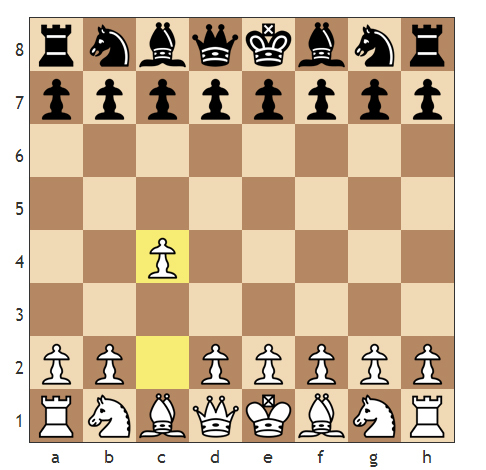 Since the server theoretically has the advantage, he is expected to win, or hold, the game. Fault: Technically any ball that goes out of bounds, but generally used to describe an illegal serve, i.e. one that either stopped by the net or lands outside the opposite service box. If this occurs on the first serve, the player gets another try. Double Fault: Same thing as above, but the illegal serve occurs on the second attempt. In this case the point is awarded to the opponent. Let: A let occurs when a serve hits the net, but still continues over it. If the ball lands legally in the service area, then it’s still the first serve. If the ball hits the net and lands outside the service area, it’s a fault. However a second serve that hits the net results in a do-over regardless of where it lands in the opponents court. Out: Usually used to describe a ball in play that lands outside the playing area. The player who hits a ball out loses the point. Ground Stroke: Any shot that a player hits after it has bounced once. Forehands and Backhands are the most typical ground strokes. Volley: A shot that is hit out of mid air, before bouncing on the court. These generally occur at or near the net. Lob: A high, arching shot that goes over the opponents head and usually lands deep in the court. These are usually defensive shots that give the hitter time to get set up for the next shot, or back an opponent away from the net. Winner: Any shot that decisively ends a point for the player hitting it, but generally a powerful or well placed shot that the opponent either can’t reach or has no chance of returning. Error: The opposite of a winner, it’s a shot that a player mis-hits into the net or out of play. Unforced errors are points that the hitter gives away to his opponent via his own mistakes. Spin: Refers to the spin or action put on a ball by a player. Topspin results in balls that arch down rapidly toward the opponent’s court and kick up high after. Backspin results from slice shots that bounce low and away from an opponent. Side spin can be used to “kick” a ball left of right after impact. Pace: Tennis speak for the speed of the ball. A player that generates a lot of pace on his shots is hitting fast balls that are more difficult to return. While there are 128 men and 128 women all competing for the Singles Championship (plus many others in doubles, mixed doubles, juniors, etc…) there are really only a handful of players you’ll want to pay attention to. That’s not to say you can’t enjoy every match, but at the end of the tournament, odds are that it will be one of the following four names will be talking about. 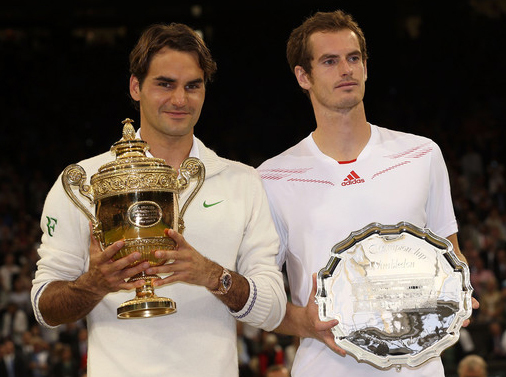 Federer defeated Andy Murray in last year’s Championship to win his record setting 17th Grand Slam title. Roger Federer: Federer is arguably the greatest tennis player in history. He’s got more Grand Slam titles than any other play (17) and the grass courts of Wimbledon are his specialty. He won the Championship from 2003-2007 straight and again in 2009. Oh, and he’s also the defending champion having won the 2012 event as well. All in all that’s a record tying 7 titles at Wimbledon, an achievement he shares with Pete Sampras. A win this year to defend his title would give him the undisputed record and join Rafael Nadal as the only other player in history to win the same major 8 times. Federer is an excellent all court player with a ton of shots and seemingly unlimited finesse. The only problem is his age. At 31 he’s far from his prime and professional tennis is a young man’s game. Going five sets against a younger, fitter opponent might prove too much. Still Federer is probably the odds on favorite to win. Andy Murray: Murray is a relative newcomer to the elite ranks of tennis and is still looking to prove himself and improve upon his lone Grand Slam title (the US Open last year). 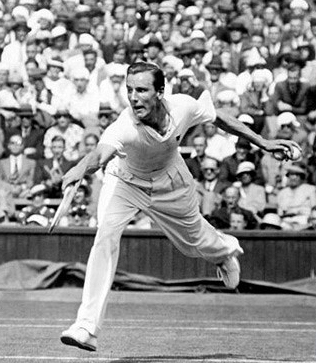 However the real story with Murray is that he represents the best shot for a British player to win the Championship since 1936. He came close last year, losing to Federer in four sets. Despite the devastating defeat, he came back to beat Federer just a few months later in the gold medal final at the London Olympic games (hosted at Wimbledon), proving that he had what it takes to beat the best on the grass. He followed up his gold medal with a US Open title last fall and a trip to the finals of the Australian Open this year. He skipped the French Open and should be well rested and poised to give Britain perhaps it’s best chance in nearly 80 years to win one for the home team. Nadal is the undisputed king of clay, but is he healthy enough to win a 3rd Championship? Rafael Nadal: Federer may be the greatest player of all time, but Rafa has made a strong case for himself as the best player of the past 5 years. His specialty is playing on clay, which is evidenced by his record setting 8 French Open titles, including his most recent earlier this month. 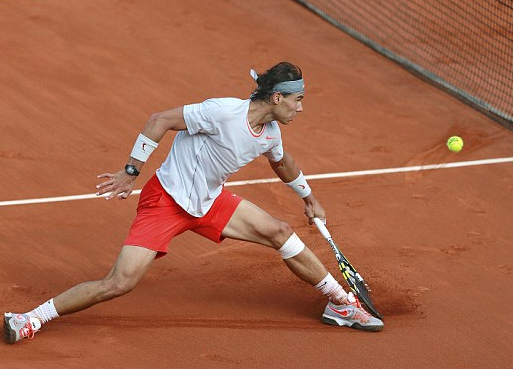 However Nadal’s skills go beyond the clay and he’s proven that he has what it takes to win just about anywhere. He has achieved a career Grand Slam and has 12 major titles under his belt, including two wins at Wimbledon in 2008 and 2010 (beating Federer both times). If Nadal has a weakness, it has to be his health. He spent most of the past year recovering from a knee injury and is still feeling his way back to the top. That being said, he still managed to win the French Open convincingly, proving that even a recovering Nadal is better than most players at 100%. Rafa has made it clear that he wants to limit his play on hard surfaces to preserve his knees, which means he’ll likely be trying extra hard to secure Grand Slam #13 on the last “soft” court major of the year. 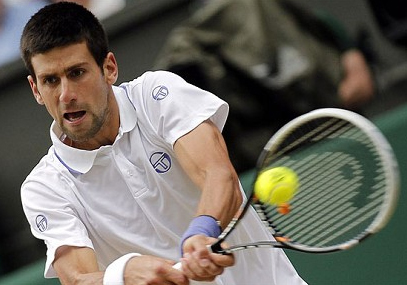 Djokovic is the best player, but does he have what it takes for a repeat of 2011? Novak Djokovic: Djokovic is probably the best all around tennis player today. At 26 he’s still relatively young, yet he’s also already managed to rack up 6 Grand Slam wins, including the Wimbledon championship in 2011 (along with the Australian Open and the US Open that same year) and the Australian Open title earlier this year. He narrowly missed the career grand slam this June in the French Open, losing a grueling 5 set semi-final match to Nadal, the eventual champion. Like Federer he’s an all court player, which should work to his advantage on grass. He’ll be a formidable opponent to whomever he faces and will probably be the favorite in every match he plays. 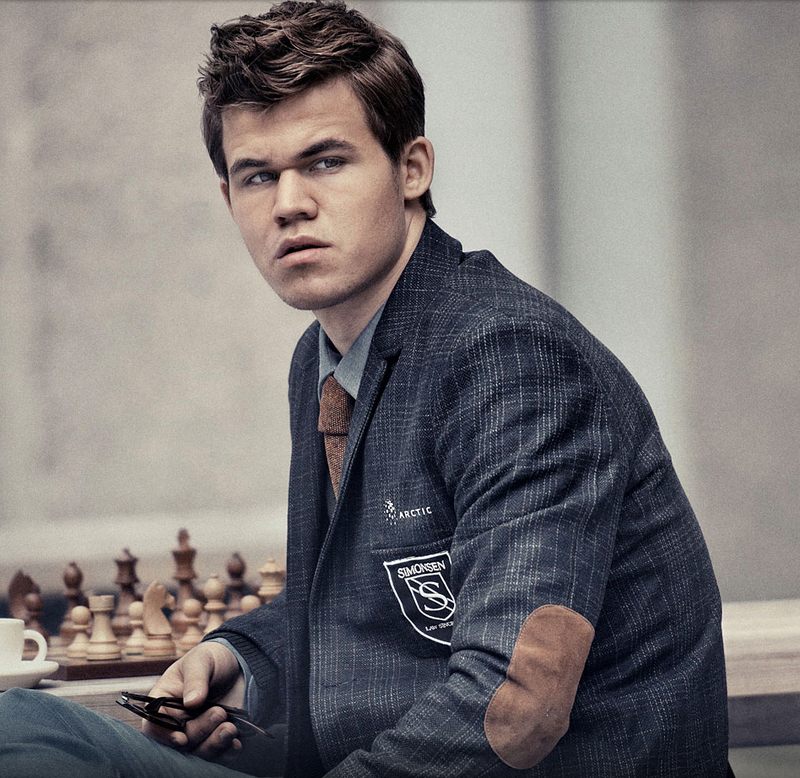 He is beatable, but only through exceptional play on the part of his opponent. Anything less and he could very well find himself with another Championship this year. Other Players to Watch: Other players to watch include David Ferrer, who made (and lost) his first Grand Slam final against Nadal in the French Open this year. Jo Wilfried Tsonga could also make trouble for the elite four, as could Juan Martin Del Porto. John Isner represents the best (if not remote) chance for the Americans. While most of the excitement will take place on the men’s side, Serena Williams is the one to watch for the women. Defending her title from last year and fresh off a dominating performance in the French Open, the question is not so much whether anyone has what it takes to beat her, but if they can even make it a competitive match. There you have it, all you need to understand, watch, and enjoy the 2013 Championships at Wimbledon in style. Not much else is required on your part but to dress smartly in white, get some strawberries and cream, and tune in June 24 to watch the action for yourself. Oh, and one final note. Nothing makes a better excuse to treat yourself to Brunch (and perhaps some Bloody Mary’s) than the Sunday final of a Grand Slam tournament, especially Wimbledon. Enjoy!